Lindstrom Air Conditioning & Plumbing is proud to serve homes and businesses in Boynton Beach, Florida. We handle air conditioning, plumbing, duct cleaning and all of your HVAC service needs. Lindstrom Air Conditioning has been serving the Boynton Beach area since 1975. Since then, we have become one of the most trusted service companies in Florida. 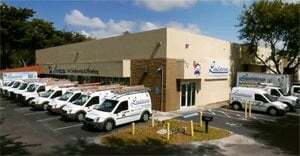 We offer a large selection of HVAC and plumbing products to help meet the needs of our Florida customers. Our products include air conditioners, heat pumps, water heaters, air purifiers and more. With a team of over 150 members, we are ready to help with all of your HVAC and plumbing needs in Boynton Beach! Our air conditioning pros are experienced and have all the tools to tackle all of your air conditioning repair and installation needs in Boynton Beach. We offer 24 hour emergency air conditioning service so you can count on us for those unexpected air conditioning problems. We also offer a wide range of air conditioners, heat pumps and more if it is time for an upgrade to the cooling system in your Boynton Beach home or business. When you contact us to make an appointment, know that we take your problems and our job seriously. We strive to earn your trust and business, and look forward to working with you. Give us a call or schedule HVAC or plumbing service online today!